This paper reports on the experience with classification of patients at the All-Africa Leprosy and Rehabilitation Training Centre (ALERT) in the Shoa Province in Ethiopia. Classification on clinical grounds is compared with classification which is primarily based on the result of skin-smear examinations. In addition, possible alternative clinical methods for the allocation of patients to the multidrug therapy (MDT) regimens arc discussed. The analysis includes 1525 new patients. In 730 patients classified clinically as paucibacillary (PB), this classification was not confirmed by skin-smear results in only 1.5%; whereas in 795 patients classified clinically as multibacillary (MB), the classification was not confirmed in 21.1%. Possible reasons, notably for the latter discrepancy, are discussed. Based on an assessment of the correctness of the diagnosis and the most probable classification, it was found that if classification had been based on the skin-smear results, 9.3% of the 795 patients classified as MB would have been classified incorrectly as PB. Classification based on clinical signs resulted in incorrect classification, MB instead of PB, of 8.7% of the 795 patients. Over-classification of MB patients, which was found to be supervisor related, is open to improvement by a strict application of clinical criteria for classification. The experience in the ALERT leprosy control program shows that classification which is based on clinical signs may, in particular, result in some PB patients being classified as MB, while classification based on the results of skin-smear examinations is more likely to result in some MB patients being classified as PB. It was concluded that, provided a number of requirements aimed at limiting the number of misclassified patients are introduced, patients can be classified based on clinical signs and, hence, in the absence of skin-smear services for routine classification purposes. Cet article rapporte l'expérience concernant la classification des patients au ";All-Africa Leprosy and Rehabilitation Centre"; (ALERT) dans la province dc Shoa en Ethiopie. Une classification sur base clinique est comparée à une classification basée en premier lieu sur le résultat dc l'examen des frottis cutanés. Dc plus, des méthodes alternatives cliniques pour la répartition des patients selon les régimes de polychimiothérapic (PCT) sont discutées. L'analyse comprend 1525 nouveaux patients. Parmi 730 patients classés cliniquement comme paucibacil-laires (PB), cette classification ne fut pas confirmée par les résultats des frottis cutanés pour seulement 1.5%; tandis que parmi 795 patients classés cliniquement comme multibacillaires (MB), la classification n'a pas été confirmée dans 21.1% des cas. Les raisons possibles, notamment pour cette dernière divergence, sont discutées. Sur la base d'une évaluation de l'exactitude du diagnostic et dc la classification la plus probable, on a trouvé que, si la classification avait été basée sur les frottis cutanés, 9.3% des 795 patients classés comme MB auraient été incorrectement classés en PB. Une classification basée sur les symptômes cliniques résulte à un classement incorrect, MB au lieu de PB, de 8.7% des 795 patients. Un excès de classification des patients en MB, qu'on a montré comme étant dépendante du superviseur, se prête à une amélioration par l'application stricte des critères cliniques de classification. L'expérience du programme dc lutte contre la lèpre d'ALERT montre qu'une classification basée sur les symptômes cliniques peut, en particulier, résulter en une classification de quelques patients PB en MB, tandis qu'une classification basée sur les résultats des frottis cutanés résultera plus vraisemblablement dans une classification comme PB de quelques patients MB. On en conclut que, pourvu qu'une série de mesures soient introduites dans le but de limiter le nombre de patients erronement classifies, les malades peuvent être classés sur la base des symptômes cliniques, et donc en l'absence de services permettant l'examen de routine des frottis cutanés. Este artículo se refiere a la experiencia sobre la clasificación de los pacientes en el Centro ALERT (All-Africa Leprosy and Rehabilitation Training Centre) de la Provincia de Shoa en Etiopia. La clasificación clínica se compara con la clasificación basada en los resultados de los extendidos dc linfa cutánea. Además se discuten diferentes métodos alternativos para situar a los pacientes dentro dc los programas dc tratamiento con múltiples drogas. El análisis incluye 1525 casos nuevos. En 730 pacientes clasificados clínicamente como paucibacilares (PB), la clasificación no se confirmó por los resultados de los extendidos dc linfa cutánea sólo en el 1.5% dc los casos, mientras que en 795 pacientes clasificados clínicamente como multibacilares (MB), la clasificación no se confirmó en el 21.1% dc los casos. Se discuten las posibles razones de las discrepancias. Con base en la exactitud del diagnóstico y en la clasificación más probable, se encontró que si la clasificación se hubiera hecho en función de los extendidos dc linfa cutánea, el 9.3% dc los 795 pacientes clasificados como MB se hubieran clasificado incorrectamente como PB. La clasificación basada sólo en los signos clínicos resultó en una clasificación incorrecta (MB en lugar de PB) del 8.7% de los 795 pacientes. La sobreclasilícación de pacientes MB, la cual se encontró relacionada con el supervisor, puede corregirse por la aplicación estricta dc los criterios clínicos de clasificación. La experiencia en el programa de control de la lepra ALERT indica que la clasificación basada en signos clínicos puede, en particular, dar como resultado que algunos pacientes PB sean clasificados como MB, mientras que la clasificación basada en los extendidos de linfa cutánea puede originar que algunos pacientes MB sean clasificados como PB. La conclusión es que manteniendo reducido el número dc factores dc error, para propósitos de clasificación dc rutina, los pacientes pueden ser clasificados basándose en los signos clínicos, y dc aquí, en ausencia de los servicios para efectuar los extendidos de linfa cutánea. In the recommendations for classification of patients for the purpose of multidrug therapy (MDT), considerable weight is given to the results of smear examinations (14,15). It is commonly said that the availability of skin-smear services is a prerequisite for the commencement of MDT (15,17). However, the quality of smears and of microscopy has been identified as probably the weakest link in most leprosy control- programs (14). In several publications (3-5,11), concern has been expressed about the poor quality of skin-smear techniques.3 If MDT is implemented in the absence of reliable skin-smear services, it may be feared that some of the patients will be wrongly classified (2-5).4-6 Of particular concern are multibacillary (MB) patients who are classified as paucibacillary (PB), and who will receive inadequate treatment. This is not only a risk to the individual patient and the community, but it may also jeopardize the reputation of MDT (2). There is a definite need for reconsideration of the present strategies of MDT implementation in leprosy control programs and, in particular, for defining alternatives for the classification of patients which are less dependent on skin-smear services. Although the World Health Organization has prepared and widely distributed guidelines for the protection of leprosy workers from HIV infection (l8), the taking of skin smears, under often poor hygienic field conditions, should also be a matter of concern. a) In some programs all clinically midbor-dcrline (BB), borderline lepromatous (BL), and lepromatous (LL) patients are grouped as MB, whether skin smears are positive or negative (9); b) Others have chosen to classify patients with more than four or five skin lesions as MB (6); c) In other areas patients with multiple and symmetrically distributed lesions arc treated as MB patients, even when skin smears are negative;5 d) A publication from western Nepal refers to the use of body areas for the clinical classification of patients for MDT (12); and e) In Papua New Guinea a ";score chart"; to assist in the classification of patients is in use (11). If, under field conditions, patients are to be classified on clinical grounds, it is of much importance that standard criteria for clinical classification are defined, and that the application of such criteria is closely supervised. Criteria for clinical classification should, as much as possible, be quantified. A clinical score chart could be an appropriate approach. An example of a score chart has been given by Nash, et al. (11). While the aim should be to arrive at the correct classification, either PB or MB, in the vast majority of the patients a score chart should include as few parameters as possible. In addition, there should be as little room as possible for difference in judgment of the score for each of the parameters. This paper reports on the experience with classification of patients under routine field conditions in the leprosy control program of the All Africa Leprosy and Rehabilitation Training Centre (ALERT) in the Shoa Province of Ethiopia. The purposes of this paper are: a) to compare the results of the classification of patients which is primarily based on skin-smear results with classification based on clinical signs, and b) to describe alternative clinical methods for the allocation of leprosy patients to the MDT regimens. In the ALERT leprosy control program, leprosy supervisors are responsible for the diagnosis and classification of patients (1). The classification which is made on clinical grounds is always confirmed by skin-smear examination. If the classification according to clinical signs is not in accordance with the skin-smear results, the clinical and skin-smear examinations are repeated. If the result of the second skin-smear examination is still not in accordance with the clinical classification, the patient is classified as MB and is treated accordingly. The grouping of patients in either the PB or MB category is according to the 1982 recommendations of the World Health Organization (15). PB patients are patients who arc clinically indeterminate (I), tuberculoid (TT) or borderline tuberculoid (BT) and who have a bacterial index (BI) of not more than 1 + at any site. MB patients are patients who are clinically BL (these include the few BB patients) or LL and who have a BI of more than 1+ at any site. In January 1990, the recommendation of the WHO Expert Committee on Leprosy of 1988 (14) to classify as PB only smear-negative I, TT, and BT patients was introduced. Any cases belonging to these types but showing smear positivity should be classified as MB for the purpose of MDT. Some supervisors unofficially had already introduced this policy earlier. Routinely, skin smears are taken from four sites, one from each earlobe and two from active skin lesions. These sites are generally accepted as appropriate. They give the highest chance of finding positive Bis (8,14,17). At ALERT, the quality of skin-smear techniques can be considered reliable. ALERT has high standards for the performance of its staff, and laboratory staff and supervisors are responsible for training in skin-smear techniques. Skin smears arc taken by a small number of the staff. In the field program these are the supervisors and some experienced health assistants. All skin smears are examined at one central laboratory. A sample of the smears which have been examined by the laboratory staff is re-examined by the head of the laboratory. This analysis is based on 1709 new patients who have been diagnosed with leprosy from July 1987 through January 1990. For 184 patients, 94 classified as PB and 90 as MB, skin-smear results were not available. These patients were excluded from the analysis. The skin-smear results of the remaining 1525 patients have been analyzed. In 1346 patients (88.3%) the clinical classification was confirmed by the skin-smear results. In 179 patients (11.7%), 11 classified as PB and 168 classified as MB, the skin-smear results did not confirm the clinical classification. Of the patients whose clinical classification was not confirmed by the skin-smear results, an ascertainment of the diagnosis of leprosy was made from the clinical records. The diagnosis of leprosy was considered certain if clinical records showed the presence of hypopigmented skin lesions with sensory loss and/or involvement (enlargement, tenderness and/or functional impairment). In addition, the most probable classification was established from the clinical records. 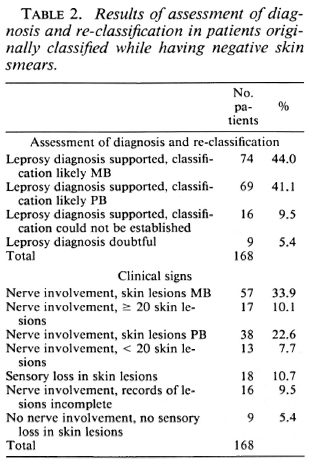 The classification of MB leprosy was considered confirmed if the records gave: a) nerve involvement and unclear edge(s) of the skin lesions, no sensory loss in the skin lesions, and/or nodular skin lesions, in the absence of satellite lesions and central healing in the skin lesions; or b) nerve involvement and 20 or more skin lesions, in case the clinical records were incomplete. The classification of PB leprosy was considered confirmed if clinical records gave: a) nerve involvement and defined edge(s) of the skin lesions and/or marked hypopig-mentation of the skin lesions, and/or raised edges of the skin lesions, and/or central healing in the skin lesions; or b) hypopigmented skin lesions with sensory loss in the skin lesions; or c) nerve involvement and less than 20 skin lesions, in case the clinical records were incomplete. The division of less than 20 skin lesions for the PB classification and 20 or more for the MB classification was chosen for the following reasons: a) On the patient records the number of skin lesions is routinely recorded as up to 5, 6 to 19, or 20 and above. Therefore, no other cut-off points could be considered, b) Of the patients with clinically and bacteriologically confirmed PB leprosy, only 41.6% had up to 5 skin lesions, 45.9% had between 6 and 19 skin lesions, and 12.6% had 20 or more skin lesions (Table 6). Of those with confirmed MB leprosy, 7.9% had up to 5 skin lesions, 22.7% had between 6 and 19 skin lesions, and 69.4% had 20 or more skin lesions (Table 6). A cut-off point of 20 skin lesions gives the least chance of over-classification of MB patients (sensitivity of 69%, specificity of 87% and predictive value of 82% compared with 92%, 42% and 56%, respectively, for a cut-off point of more than 5 skin lesions). For defining standard clinical criteria for the classification of patients, the computerized data of the same patients who were included in the comparison of methods for classification of patients were used. However, only the 1346 patients whose clinical classification was confirmed by skin-smear results were included in the analysis. Several combinations of clinical signs were tested, starting with one sign, the number of skin lesions, and subsequently adding more. For 1164 of the 1346 patients (86.5%), the number of skin lesions had been recorded. Due to incompleteness of the clinical records, the number of patients who were included in subsequent score charts decreased with the adding of more clinical signs. Score charts which include the clinical signs and number of patients are presented in Tables 6 through 11. Skin-smear results, the highest BI of the four sites, of the 1525 new patients are given in Table 1. Of the 730 patients classified as PB, 690 (94.5%) had negative skin smears, 29 (4.0%) had a BI of 1, and 11 (1.5%) had a BI of 2 or above. Of the 795 patients classified as MB, 168 (21.1%) had negative skin smears, 28 (3.5%) had a BI of 1, and 599 (75.3%) had a BI of 2 or above. Because of different policies for the grouping of patients with a BI of 1, this skin-smear result was considered acceptable for both PB and MB classifications. Hence, in 1.5% of the patients classified as PB and in 21.1% of the patients classified as MB the clinical classification was not confirmed by the skin-smear results. In most of these patients the skin-smear examination was not repeated. The ascertainment of the diagnosis of leprosy and the most probable classification gave the following results: a) In 8 of the 11 patients classified as PB, but with positive skin-smear results, the clinical records strongly supported PB leprosy. Two of these patients had hypopigmented skin lesions with sensory loss and six had nerve involvement with skin lesions characteristic for PB leprosy. In two patients the records supported MB leprosy, nerve involvement and skin lesions characteristic for MB leprosy. In one patient the clinical records were incomplete, b) In 143 of the 168 patients (85.1%) classified as MB, while having negative skin smears, the diagnosis of leprosy and the most probable classification could be established from the clinical records (Table 2). The records of 69 patients supported PB leprosy and those of 74 patients, MB leprosy. In nine patients the clinical records gave insufficient evidence for the diagnosis of leprosy, and in 16 patients there was sufficient evidence for the diagnosis but insufficient information to establish the most probable classification. The clinical signs on which these conclusions were based are also given in Table 2. Of the 74 patients whose records supported MB leprosy, this was based on the presence of nerve involvement and skin lesions characteristic for MB leprosy in 57 patients and on the presence of nerve involvement and 20 or more skin lesions in 17 patients. For the 69 patients whose records supported PB leprosy, this was based on nerve involvement and skin lesions characteristic for PB leprosy in 38 patients, nerve involvement and less than 20 skin lesions in 13 patients, and sensory loss in the skin lesions in 18 patients. 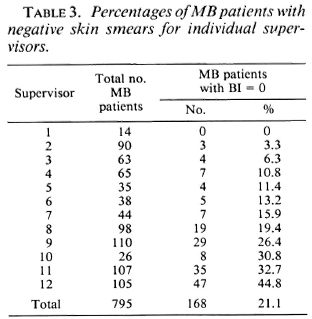 The variation among the supervisors in percentage of patients who were classified as MB and who had negative skin smears is presented in Table 3, and ranges from 0% to 44.8%. Table 4 presents the results of the assessment of the diagnosis and reclassification of the 168 patients originally classified as MB (and with negative skin-smear results) for the individual supervisors. In Table 5 the number and percentage of MB patients for whom the MB classification was confirmed arc given for the individual supervisors. The classification of MB leprosy is considered confirmed if it is supported by the skin-smear results or by the re-assessment of the clinical signs. The percentage of patients with confirmed MB leprosy ranges from 67.6% to 100%, with an average of 88.2%. In Table 6 the numbers of skin lesions for 1164 new patients whose clinical classification was confirmed by skin-smear results are presented. 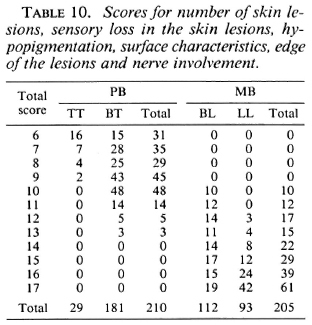 The scores for the number of skin lesions and sensory loss in the skin lesions for 485 PB and 378 MB patients are given in Table 7. 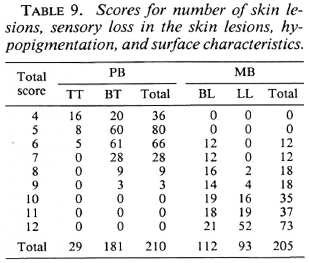 Table 8 gives the scores for the number of skin lesions, sensory loss in the skin lesions, and hypopigmentation in the lesions for 292 PB patients and 248 MB patients. In Table 9 scores for the number of skin lesions, sensory loss in the skin lesions, hypopigmentation and surface characteristics are presented for 210 PB patients and 205 MB patients. 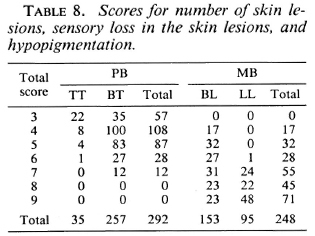 The scores for number of skin lesions, sensory loss in the skin lesions, hypopigmentation, surface characteristics, edge of the lesions, and nerve enlargement for 210 PB and 205 MB patients arc given in Table 10. 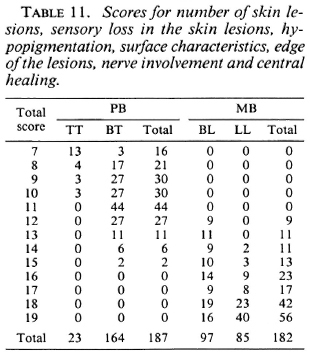 The scores for the number of skin lesions, sensory loss in the skin lesions, hypopig-mentation, surface characteristics, edge of the lesions, nerve enlargement, and central healing for 187 PB and 182 MB patients are given in Table 11. Table 12 summarizes the percentages of patients who would have been misclassified, and would either be over-treated or under-treated, for the different combinations of clinical signs, in case different total score cut-off points for the division into the PB or MB category are applied. If, in the score of the number of skin lesions, patients with more than five lesions would be considered MB, this would result in 58.5% of the PB patients being classified as MB and, hence, would be over-treated. In addition, 7.9% of the MB patients would be classified PB and would be under-treated. If, in the example of seven clinical signs, patients with a total score of more than 12 are considered MB, 10.2% of the PB patients and 4.9% of the MB patients would be misclassified and would be over-treated and under-treated, respectively. In 719 of the 730 patients (98.5%) who were classified as PB on clinical grounds, the classification was confirmed by skin-smear results. In 11 patients (1.5%), a BI of more than 1 was reported. Because in eight of these patients the clinical records strongly support PB leprosy, there is a possibility of false-positive smear results, or that skin smears have been mixed or mistakes have been made in the process of copying the results. The possibility of false-positive results, due to artifacts which arc difficult to distinguish from acid-fast bacilli, has been reported (13). It was not possible to detect whether one or the other reasons had been the case. from the very fact that in 98.5% of the patients classified as PB the clinical classification was supported by skin-smear results, it can be concluded that skin-smear examination added little to the classification which was made on clinical grounds. A possible misclassification, leading to un-der-treatment, of 1.5% of 730 patients classified as PB (less than 1% of the total 1525 patients) is very acceptable for a field program. There is, therefore, in the ALERT leprosy control program, no strong reason for doing routine skin-smear examinations in patients who, on clinical grounds, are classified as PB. This observation, which should be supported by findings elsewhere, could have far-reaching importance for leprosy control programs and for organizations which recommend strategies for leprosy control. While in 78.9% of the patients who, on clinical grounds, were classified as MB the classification was confirmed by skin-smear results, 21.1% of the patients had negative skin smears. The following possibilities for the discrepancy between the clinical classification and the results of the skin-smear examination were considered: a) The technique of taking skin smears was not correctly applied, b) Patients with negative skin smears suffer from another disease which mimics leprosy, c) Some positive skin smears have been missed by the laboratory staff, and d) Supervisors over-classify MB leprosy. Incorrect application of skin-smear techniques. Over 80% of the skin smears are taken in the field by leprosy supervisors and some experienced health assistants. The techniques of smear taking are regularly assessed by the head of the ALERT laboratory, and there is a continuous feedback on the quality of the skin smears. The performance of the leprosy control staff was, at several times, evaluated as satisfactory to very good. The quality of the skin smears of two of the three supervisors with the highest percentage of MB patients with negative skin smears was always reported as very good. Although this possibility for the discrepancy cannot completely be excluded, it is likely that it is not a major cause. Patients suffer from another disease. In 159 of the 168 patients (94.7%), the correctness of the diagnosis of leprosy could be confirmed from the clinical records (Table 2). Therefore, not more than nine patients might have suffered from another disease. Positive skin smears have been missed. Negative skin-smear results were reported in 858 of the 1525 patients (56.3%) and positive skin-smear results in 667 patients (43.7%) (Table 1). Of the patients with positive skin smears, 212 (31.8%) had a BI of 1, 2, or 3 and 455 (68.2%) had a BI of 4, 5, or 6. This is an unusual distribution for which no explanation has so far been forthcoming. One would have expected a higher number of patients with low BIs. If this assumption on the distribution of skin-smear results would be correct, part of the patients with low BIs will have been missed. 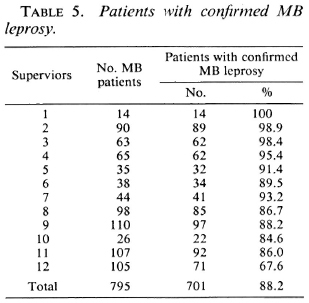 This is supported by the observation that in 74 of the 168 patients classified as MB but with negative skin-smear results, the clinical records support MB leprosy (Table 2). In addition, there is a technical problem with the detection of only a few bacilli in skin smears. It is a general observation that bacilli are usually unevenly distributed over the smear area (7). Routinely, 100 microscopic fields have to be examined, which represent only about 2.5% of the smear area (7). Even if skin-smear techniques are properly applied, it is quite possible that bacilli will not be detected in parts of some smears where the numbers of bacilli are low. Further, when large numbers of smears have to be examined, laboratory staff tend to make a judgment after examination of less than 100 fields (personal observation). The possibility that low densities of bacilli arc missed has also been reported by others (3,10,16). Vettom, et al. reported in a multi-center study that the highest percentage of low correlations between the service laboratories and the reference laboratory was found in the false-negative smears (13). In order to confirm that positive skin smears have been missed, the skin smears should have been re-read. The opportunity for re-reading was, except in a few cases, not used. In addition, skin-smear examination was usually not repeated. Similarly, some low BI results might have been missed among patients who have been classified as PB. Whether or not this had been the case could not be detected. Over-classification of MB leprosy. 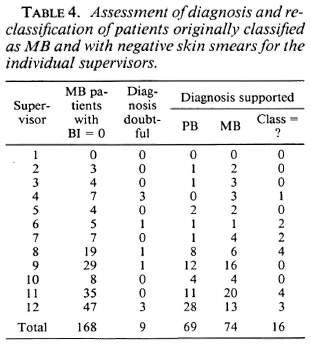 If one looks at the individual supervisors, major differences in the percentage of patients classified as MB, in whom the classification was not supported by skin-smear results, can be observed (Table 3). It was found that the clinical judgment of the supervisors is influenced by the relative importance they give to the different clinical signs. Some give considerable weight to the number of skin lesions and tend to classify patients with ten or more skin lesions as MB. Others take other signs into consideration. Some supervisors tend to over-classify MB patients, because they do not feel at ease with the 6 months of MDT for PB patients. This attitude was, on several occasions, discussed with the supervisors. During 1989 a stricter policy for application of clinical criteria for classification of patients has been introduced at ALERT. 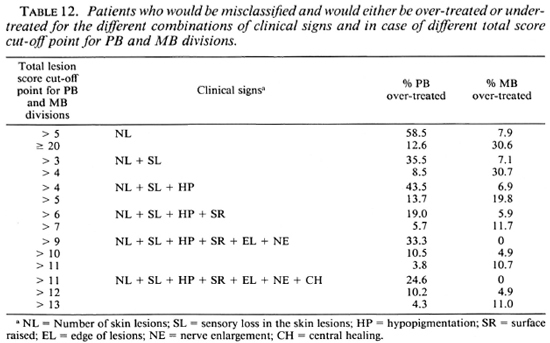 The observation that in 69 of the 168 MB patients with negative skin smears the clinical records support PB leprosy (Table 2) confirms that there is over-classification of MB patients by some supervisors. 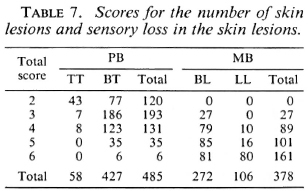 If the 74 patients with negative skin smears, but whose re-assessment of the clinical records supported MB leprosy (Table 2), arc included in the group of MB patients, 701 of the 795 patients (88.2%) can be considered as MB (Table 5). Of the remaining 94 patients, the clinical records support PB leprosy (69 patients), the diagnosis of leprosy was doubtful (9 patients), or the most probable classification could not be established (16 patients) (Table 4). Six supervisors score over 90% of correct classifications (Table 5). This would be an acceptable percentage for a field program. Five supervisors score between 80% and 90%, and one supervisor scores less than 70%. The latter percentages could be increased if standard criteria for clinical classification are strictly applied. from this analysis, the following conclusions can be drawn: a) If, for classification purposes, the decisive factor would have been the outcome of the skin-smear examinations, part of the MB patients would incorrectly have been classified as PB and, therefore, would be under-treated. In this analysis, these were 74 patients or 9.3% of the 795 patients who, after assessment of the clinical records, were considered MB in spite of probably false-negative skin-smear results, b) Classification which is primarily based on clinical signs may result in over-classification of MB patients. In this analysis, this was observed in 69 patients or 8.7% of the 795 patients who were classified as MB but were subsequently, on assessment of the clinical records, considered to be PB. Over-classification of MB patients was supervisor-related; 63 of the 69 patients (91.3%) were classified by five of the 12 supervisors (Table 4). c) In only a few patients the classification of PB (made on clinical grounds) was not supported by the results of skin-smear examinations. This was observed in 11 out of 730 patients, of whom 8 patients on assessment of the clinical records were considered PB in spite of probably false-positive skin-smear results, d) Even under conditions which can be considered optimal, some patients will be mis-classified and will cither be under-treated or over-treated, whether the classification is based on clinical signs or on skin-smear results. The experience in the ALERT leprosy control program shows that classification which is based on clinical signs may, in particular, result in some PB patients being classified as MB, while classification based on the results of skin-smear examinations is more likely to result in some MB patients being classified as PB. The evidence above shows that classification on clinical signs is not inferior to classification which is based on the results of skin-smear examinations. This experience shows that patients can be classified on clinical grounds and, hence, MDT can be introduced in the absence of skin-smear services for routine classification purposes. In order to limit the number of patients who will be misclassified, certain requirements should be fulfilled: a) Standard criteria for clinical classification should be defined and strictly applied, b) Classification of patients should be the responsibility of supervisors and not of general medical staff. The supervisors should be properly trained in the classification of patients according to standard criteria, and the application of these criteria should be closely supervised, c) A system of assessment of the quality of clinical examination and classification on clinical grounds should be introduced. A sample of, for example, 10% of the MB and PB patients' skin smears should be examined in a reference laboratory. Hence, the availability of a high-quality skin-smear service at one or a few reference laboratories remains essential. If patients could be classified based on the number of lesions, this would be a simple method of grouping patients in either the PB or MB category. Classification based on the number of skin lesions is practiced in some leprosy control programs. However, the hazards of over-classification and over-treatment may be considerable if a cut-off point of five skin lesions is used for the subdivisions into PB and MB leprosy. 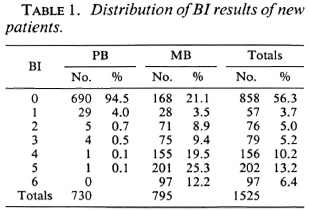 When this was applied to the patients diagnosed in the ALERT leprosy control program in whom the clinical classification had been confirmed by skin-smear results, this resulted in 58.5% of the PB cases being classified as MB, and 7.9% of the MB patients being classified as PB (Table 12). The latter percentage may be acceptable for a field program. However, the percentage of misclassified PB patients is far too high. A cut-off point of more skin lesions would result in a higher percentage of misclassified MB patients, namely, 30.6% for 20 or more skin lesions (Table 12). from these observations, it can be concluded that classification of patients based on the number of skin lesions, if applied in the ALERT leprosy control program, would result in a considerable percentage of misclassified patients. Whether classification based on the number of lesions would be justified in other parts of the world would have to be based on locally collected clinical data. Further, a possible classification method based on the number of lesions should not only include skin lesions, but also nerve lesions (enlargement, tenderness of peripheral nerves). If two, three, or four clinical signs are included in the score chart and if different cut-off points for total scores are applied, either the percentage of PB patients who will be classified as MB will be unacceptably high or this will be the case with the percentage of MB patients who will be classified as PB (Table 12). However, the combined use of several clinical signs increased the validity of the clinical testing. In the score charts, which include six and seven clinical signs, cut-off points can be identified which give acceptable percentages of patients misclassified either way. If in the example of six clinical signs the patients whose total score is up to 10 are classified as PB and those with a total score of more than 10 as MB, 10.5% of the PB patients and 4.9% of the MB patients will be classified incorrectly (Table 12). For a total score cut-off point of 12, in the example of seven clinical signs, this would apply to 10.2% of the PB patients and to 4.9% of the MB patients. Hence, there is no difference between the latter two score charts in the percentages of misclassified patients, when applied to these series of patients. The percentage of 4.9% potentially misclassified MB patients is the lowest percentage which could be obtained with the combinations of clinical signs and the various cut-off points used. At this level, one additional clinical sign apparently does not increase the percentage of patients who will be classified correctly. Compared with less than five clinical signs, an increase in the percentages of correct classifications can be observed. In this material the optimal number of clinical signs which arc to be included in a score chart should be five or six. The above score charts are examples of possible charts for use in classifying leprosy patients. Several other combinations, and using different scores for the various clinical signs, could be considered and tried out. With this analysis, an attempt was made to define an alternative for classification which is, at present, primarily based on the results of skin-smear examinations. This retrospective analysis certainly has limitations, in particular because of the incompleteness of part of the clinical records. However, looking at the clinical, rather than the bacteriological criteria for the allocation of patients to either the PB or MB regimen of MDT could be of considerable importance for control programs. A clinical system for grouping of patients certainly needs further study. Possible systems could be tested in areas where studies on, for example, the effectiveness of MDT are implemented, where the quality of the skin-smear services is good, and where detailed clinical data of the patients are available. Acknowledgment. I should like to express my thanks to the ALERT leprosy control supervisors who recorded all of the data, to Mr. W't Mannetje and Mr. Tesfaye Fekade who computerized the data, and to the ALERT/AHRI Research Committee for the approval of this study on the operational aspects of MDT. 1 also wish to thank Prof. A. S. Multcr, Prof. H. A. Valken-burg and Dr. P. Feenstra for their comments and suggestions. This study was made possible through the financial support by the Armauer Hansen Research Institute. This Institute is supported by the Norwegian and Swedish Agencies for International Development, NORAD and SIDA, respectively. 1. All Africa Leprosy and Rehabilitation Training Centre. Manual for implementation of multiple drug therapy. 2nd rev. Addis Ababa: ALERT, 1987. 2. Becx-Bleumink, M. Operational aspects of multidrug therapy. Int. J. Lepr. 57(1989)540-551. 3. Georgiev, G. D. and McDougall, A. C. The bacteriological examination of slit-skin smears in leprosy control programmes using multiple drug therapy: a plea for radical changes in current operational methodology. Indian J. Lepr. 59(1987)373-386. 4. Georgiev, G. D. and McDougali, A. C. Skin smears and the bacterial index (BI) in multiple drug therapy control programs: an unsatisfactory and potentially hazardous state of affairs. (Letter) Int. J. Lepr. 56(1988)101-103. 5. Georgiev, G. D. and McDougall, A. C. A reappraisal of clinical and bacteriological criteria in the implementation of multidrug therapy for leprosy control programmes and proposals for their better use. Lepr. Rev. 64(1990)64-72. 6. Grugne, A., Nadkarni, N. J. and Kini, M. S. Multidrug therapy in paucibacillary leprosy-a five year experience. Indian J. Lepr. 60(1988)589-592. 7. Gupte, M. D., Raj, C. A. D., Kannan, S. and Desikan, K. V. Reliability of direct skin smear microscopy in leprosy. Indian J. Lepr. 60(1988)566-571. 8. Hastings, R. C, ed. Leprosy. London: Churchill Livingstone, 1985. 9. Indian Ministry of Health and Family Welfare. Guidelines for multidrug treatment in endemic districts. National Leprosy Eradication Programme. New Delhi: Directorate General of Health Services, 1989. 10. Lucas, S. B. and Ridley, D. S. The use of his-topathology in leprosy diagnosis and research. (Editorial) Lepr. Rev. 60(1989)257-262. 11. Nash, J. E., Hudson, B. J. and Pyakaluia, T. Leprosy score chart to assist classification. (Letter) Lepr. Rev. 60(1989)242-243. 12. van Brakel, W., Kist, P., Noble, S. and O'Toole, L. Relapses after multidrug therapy for leprosy: a preliminary report of 22 cases in west Nepal. Lepr. Rev. 60(1989)45-50. 13. Vettom, L. and Pritze, S. Reliability of skin smear results: experience with quality control of skin smears in different routine services in leprosy control programmes. Lepr. Rev. 60(1989)187-196. 14. WHO Expert Committee on Leprosy. Sixth report. Geneva: World Health Organization, 1988. Tech. Rep. Ser. 768. 15. WHO Study Group. Chemotherapy of leprosy for control programmes. Geneva: World Health Organization, 1982. Tech. Rep. Ser. 675. 16. WHO Study Group. Epidemiology of leprosy in relation to control. Geneva: World Health Organization, 1985. Tech. Rep. Ser. 716. 17. World Health Organization. A guide to leprosy control. 2nd ed. Geneva: World Health Organization, 1988. 18. World Health Organization. Guidelines for personnel involved in the collection of skin smears in leprosy control programmes for prevention and control of possible infection with HIV. Geneva: World Health Organization, 1987. 1. M.D., D.T.P.H., Leprosy Control Division, All Africa Leprosy and Rehabilitation Centre (ALERT), P.O. Box 165, Addis Ababa, Ethiopia. Reprint requests to Dr. Becx-Bleumink at her present address: Plasweg 15, 3768 AK Soest, The Netherlands. Received for publication on 27 July 1990. 3 World Health Organization. Report of the third coordinating meeting on implementation of multidrug therapy (MDT) in leprosy control programmes. WHO/ CDS/LEP/88.4. 4 UNDP/World Bank/WHO Special Programme for Research and Training in Tropical Diseases. Report of the fifth meeting of the Scientific Working Group on the Chemotherapy of Leprosy. TDR/THELEP-SWG(57) 86.3. 5 World Health Organization. Report of a consultation on implementation of multidrug therapy for leprosy control. WHO/LEP/85.1. 6 World Health Organization. Report on the second coordinating meeting on implementation of multidrug therapy in leprosy control programmes. WHO/CDS/ LEP/87.2.